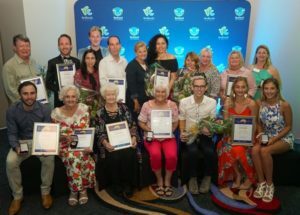 Redlands Coast residents who have dedicated their time and talents to helping their community were celebrated at the 2019 Redlands Coast Australia Day Awards at the Alexandra Hills Hotel Function Centre on 22 January. Mayor Karen Williams said the annual awards were a fitting way to thank those community members who continually go “above and beyond” to make Redlands Coast a better place to live, work and play. “The selflessness, dedication and achievements shown by these community members reflects the community spirit of Redlands Coast,’’ Cr Williams said. “We are blessed to have so many community members who demonstrate such generosity of spirit and a desire to help others, as well as those who are great role models and excelling in their chosen pursuits. “These awards are an opportunity for us, as a community, to acknowledge their efforts and give them a collective pat on the back for what they do. “Our Citizen of the Year, Maryann Talia Pau, is a truly amazing person who has worked tirelessly to bring awareness to the destructive effects of violence. Mayor Karen Williams with Citizen of the Year Maryann Talia Pau. “Maryann started the One Million Stars to End Violence Campaign, which encouraged people to help weave one million stars to pledge an end to violence in our society. “Partnering with the Queensland Government from 2016, Maryann worked to create an installation of these stars in the Museum of Brisbane in the lead up to the Gold Coast Commonwealth Games in 2018, with many other installations showcased across the State. 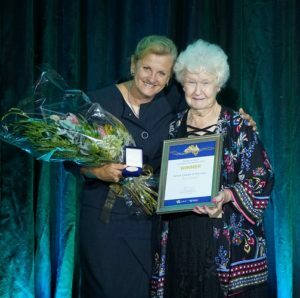 “Rita Morris, our Senior Citizen of the Year, was the driving force behind the establishment of Myhorizon Inc.
“Since this organisation began in 1981, Myhorizon has expanded to what is now one of Queensland’s leading not-for-profit disability services organisations, empowering more than 2000 people to reach their potential each year. Mayor Karen Williams with Senior Citizen of the Year Rita Morris. Cr Williams said Lamb Island Fire Brigade first officer Noel Walker was a deserving recipient of the Local Hero Award. “Noel expanded the brigade’s volunteer base from none to 30 and was instrumental in seeing the brigade taken into the folds of the Queensland Ambulance Service and able to provide support to paramedics travelling to the island. Mayor Karen Williams with Reconciliation Award winner Joshua Walker. Cr Williams said Quandamooka man Joshua Walker was a highly deserving recipient of the Reconciliation Award. “Joshua willingly shares his cultural knowledge through talks, song and dance,” she said. “He also contributes to restoring Jandai – the language of Quandamooka Country – through these and other cultural pursuits. “This year, two winners received the Environment and Sustainability Award. “Redlands After-hours Wildlife Ambulance provides a vital, 24/7 response to calls about sick, injured or orphaned wildlife across Redlands Coast, while Amy Glade advocates tirelessly for the welfare of the local community and the protection of the local environment. “Local production company and educational institution ROCKIT Productions is integral to fostering young, aspiring performers on Redlands Coast and is a fitting recipient of the Cultural Award. “Adam Pryde and Cleveland Air Magic – Gold Fire Team were both Sports Award recipients. Cr Williams said Council received 37 nominations across the nine categories. 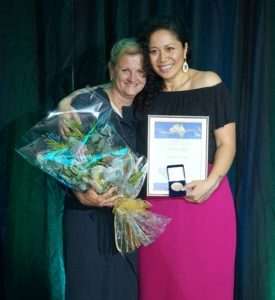 “These nominations show the amazing community spirit that flows across Redlands Coast,” she said. 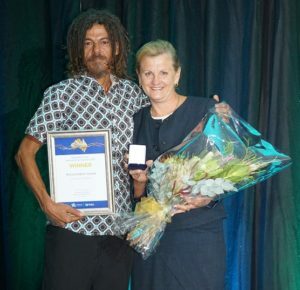 Community Organisation Award: Running Wild – Youth Conservation Culture Inc.
Mayor Karen Williams celebrates with recipients of Redlands Coast Australia Day awards.